Hip Flasks have a split identity. On the one hand, sneak your favourite booze into a nightclub and surreptitiously order coke all night while slipping in some pocket JD. On the other, take a swig on the ski slope or on a cold, frosty walk and momentarily imagine yourself as a man of the landed gentry. 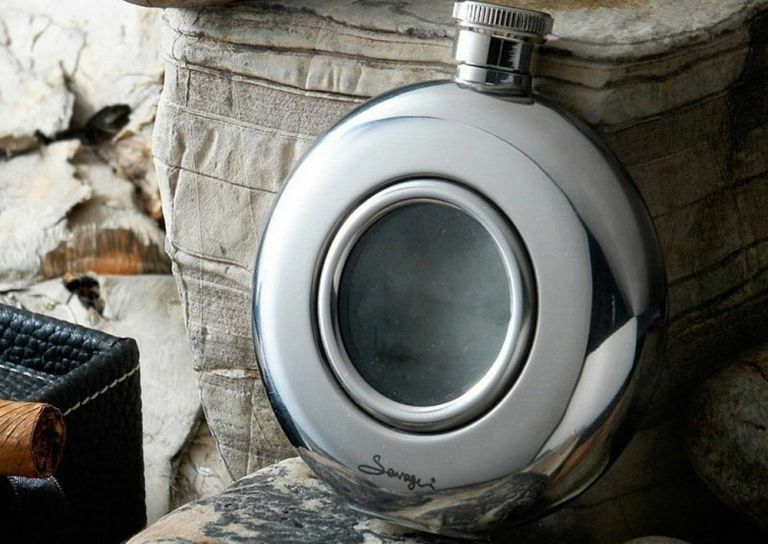 Our best hip flask at the moment is the Savage Round Hip Flask. If you fancy yourself a bit of a booze fanatic, you may be one of those people who convinces themselves that the taste of the drinking device actually imprints its own flavour into the liquid it holds. So whether you’re a metalhead, or plastic proves to be the chalice of choice, our list of best drinking flasks covers both ends of the spectrum. When buying a hip flask, size and shape is important. Remember the age-old conundrum - square peg, round hole? A large, round shaped hip flask isn’t going to glide into your pocket any time soon which is why you typically find that the best traditional hip flasks are created with the iconic curved shape to fit snugly against the hip. However, if you are planning on bucking the trend and don't actually intend to store your hip flask in your pocket, there are some decent sized round hip flasks out there, ideal for throwing in with your fishing tackle. If you are planning on passing your flask down through the generations, opt for a stainless steel hip flask with timeless appeal. The great thing about stainless steel is that you can pretty much take it to any jewellers and get it engraved with a family name or motto, making it perfect as a gift to hand down through the family. So, whether it’s a mate’s birthday present or the beginnings of a family heirloom, buy the best hip flask with the help of our guide. If you’re out adventuring and you feel like a swig of something fiery and warm, reach into your pocket and take out your fancy, glass panelled hip flask - just don’t lose the lid. This is a traditionally styled hip flask with a handy glass window that lets you keep an eye on the liquor levels as you sip away at your favourite whisky. With sleek, curved edges and a nod to the sea with its port hole style window, this is one of best stainless steel hip flasks out there for fishermen or anyone looking for a quality hip flask they can get engraved. Packing just 142ml, its size is petite but that means you can keep it safe and well hidden from potential whiskey thieves. If you need an adventure companion, nothing fits the mould more than the Stanley Adventure eCycle Flask. Fill its 199ml capacity with your favourite tipple and take it along with you as a well-earned treat after you have tackled cliff faces and steep climbs. Some info for eco-warriers - it’s made from dishwasher safe recycled plastic and with a lifetime warranty, it’ll battle with whatever your life throws can throw at it. If you often find yourself heading out on adventures with no pubs in sight, make this recycled plastic hip flask your new outdoors buddy. If you’re struggling with what to purchase your great uncle Albert this Christmas, this understated hip flask from award winning Danish designer Eric Magnussen is a guaranteed crowd pleaser. What sets this apart is its pewter shell - an amalgamation of quality metals that make it worth an RRP of £99.00. Price aside, its sleek design keeps this petite hip flask perfectly pocket sized. If you have been searching for a classic hip flask and are thinking about buying one to hand down through the generations, this is guaranteed to go the distance. Plus, with its simple pewter outer shell, you can get this hip flask engraved with a family motto, name or simply a quirky message. Camping - check. Outdoor pursuits- check. On the slopes- check. Yep - this flask is a great all-rounder. Downside- try fitting its bulky, rounded shape into your pocket. Despite this, it's the titanium we’re concentrating on here; which makes it lightweight, stronger than steel, anti-corrosive and virtually life proof. Provided that wherever you're going, you'll be taking a bag with you, this seemingly everlasting hip flask will stand the test of time and see you through a lifetime of adventures. One for the wine drinkers! There is no shame in owning a wine pouch, which is essentially the purpose of this BPA Free Plastic flask. But if you look at it from another angle; that’s over 11 shots of something stronger if you’re attending a party or need an alcohol supply that lasts a couple of days. At 285ml, the Vapur Incognito Flask is the biggest of our bunch and one that can compensate its shape for an awkward space. For anyone heading to a festival or camping trip where the thought of traipsing around with an empty steel hip flask in your pocket is less than ideal, this travel friendly plastic flask compresses down as soon as you've emptied its contents. This two in one flask set is a great option for exploring couples. Say you love a sip of whiskey but she loves a glug of gin - that’s both of you satisfied and an argument avoided. It’s all about the finishing touches though. There’s a popper to keep each unit in place, and a classically British lining that gives it a finish worthy of a birthday or Christmas gift. For anyone who likes the idea of romantic strolls with warming swigs of your favourite tipples along the way, arm yourself with an Aspinal of London Double Hip Flask and you'll create a bonding experience like no other. The best hip flask for couples on our list. One for the whisky drinkers? We say one for the whiskey drinkers in case you want to stay loyal to the Scottish heritage design...but feel free to entertain any tipple in this medium sized flask. The traditional shape of this hip flask makes it ideal for pockets and great for parties, while the flip back screw lid means you won’t be launching a nationwide search for the cap anytime soon. If you've got a son, grandson or nephew heading of to university and want to send him off with a gift he will actually use, you can't go far wrong with this Harris Tweed Hip Flask. While there’s nothing wrong with a sneaky swig, sometimes it’s all about the show of a shot. This nifty party item with its collapsible shot glass is the perfect present idea. And at an RRP of £18.00, it won’t break the bank. With the capacity to store 230ml of liquor, there will be enough of the good stuff for a couple of rounds. For anyone who has been signed up to secret santa, this is an ideal Christmas gift for colleagues and friends a-like. No, it probably won't last forever, but it beats handing over a Lynx deodorant gift set.